With the Oxygenics Smart Pause RV Shower Head you can save up to 20% more water while making your water tank last longer. Patented revolutionary technology infuses oxygen into the water to increase spray velocity to produce a high flow shower even with low water pressure. This allows for a clean-rinsing self pressurizing shower. The flow control valve lets you customize your shower from a soft and relaxing flow to a pulsating and massaging high flow. The Oxygenics technology increases oxygen content in the water by up to 10x, oxygen helps to purify the water by creating negatively charged ions that counter damaging free radicals giving you rejuvenated, younger looking skin. With a new smart pause shut off valve you can turn your shower pressure from high to low to conserve 30-70% of water and energy that's used by traditional shower heads, which makes this great for RV's. Fits 1/2" standard hose connection. 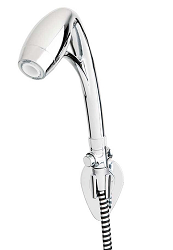 Includes: Handheld shower head, 60” hose, SmartPause valve, wall mount holder and plumber’s tape.